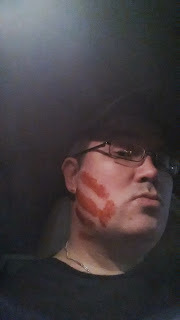 My present from the "surgeon" at the Cuckoo's Nest at Fear Itself at Legend Park in Mishawaka, Indiana. Look for our review coming soon! Had a fun time at the Niles Haunted House Scream Park﻿ in Niles Township, Michigan last night. $30 for five haunts - three haunted houses, one haunted maze, and a hayride. Main house is over 20 minutes long, filled with animatronics and such. A lot like a fun fair at the carnival. The place as been around for 40 years now, and it definitely has a "throwback" feel - I felt as if we were at a 70's carnival. Wonderful retro feel that includes all of the haunted house sets, too. You can tell some of the props are very old, but it's kind of like visiting an old, abandoned fun fair in some ways. Unfortunately, no photos of any kind are allowed (no cameras are even allowed into the park and yes, they do pat you down and use metal detectors). Look for a writeup coming soon! Countdown to 2013 - one day to go! 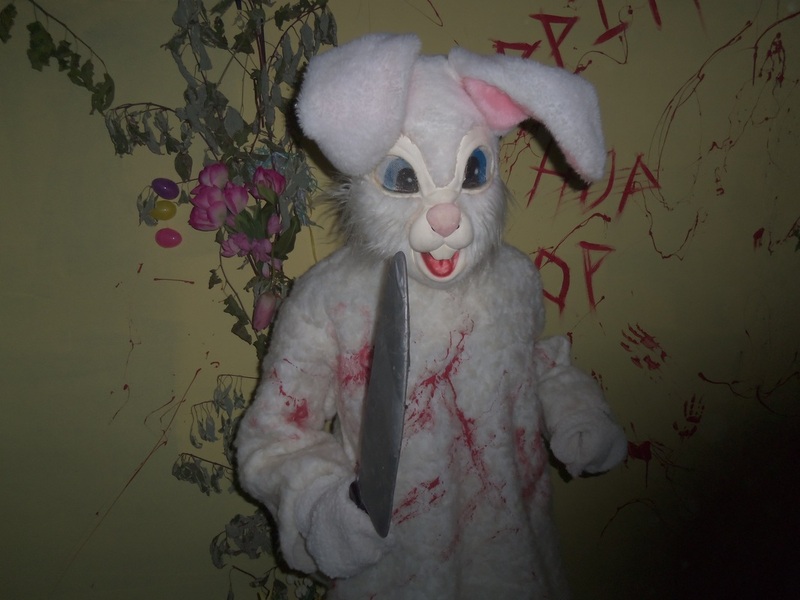 We at Horror Tourers will officially start the 2013 haunt season tomorrow, with a visit to several local attractions. We have some last minute finalizing to do, but we'll either be at the Niles Screampark in Niles, Michigan, or Evil Intentions in Elgin. There's not a lot going on this weekend, but we like to make sure we maximize the haunt season. At right is our "we were here" card - as we tour around various haunts, we sometimes run into the owners/operators, but other times there's no one around. Thus, we like to leave a card to let people know we were there and that we'll be reviewing the haunt. If you are an owner/operator and see this card, you'll know we've been there, so look for our review! 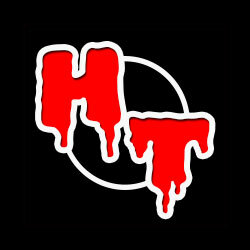 Horror Tourers - Coming Soon to a Haunt Near You! Only two more days until Haunt Season 2013 begins. We've got a packed schedule already, and we'll be keeping everyone up to date on where we'll be and when. Be sure to say hello! 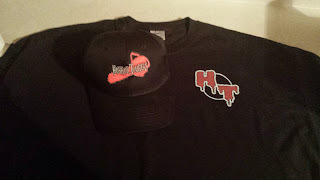 At right is an example of our Horror Tourers wear - look for it! Only three days left until the first haunting weekend! Today's post is our video commentary for Nightmare on Cronin home haunt in Justice, IL - a fantastic home haunt that we look forward to every year. Nightmare on Cronin is one of those haunts that just makes the entire haunting experience worthwhile. It really shows how people get into the Halloween spirit, and how home haunters can really make a lot out of a little. It also shows how enthusiasm can really make or break a haunt. Check out our full review here. Our countdown continues with our commentary on an excellent haunt - Cicero Hall of Horrors in Cicero, IL. This haunt has very long lines, and now that we've been there we know why! Lots of twists and turns, great use of space, and some surprises, too. Check out our thoughts here. Over the years that we have been touring, we've come across a lot of things that we have liked, from creative twists on old ideas, to elaborate setups, to things that just plain stand out from the ordinary. Conversely, we've also developed a dislike for certain things that we encounter in haunted houses. Here's a short video outlining some of the things we don't really like in haunted houses. These are things that can apply to any houses, not just certain ones, and when we encounter them they tend to make our experience a bit less enjoyable. Monsters and Madmen is a haunt we really miss. It was held in a small garden center in Homer Glen, but showed good things come in small packages, as the haunt packed in the scares. We loved this haunt. It had great set design, actors, and some clever twists and turns. Unfortunately for us (and everyone else), 2010 seems to have been its last year. Fortunately, Horror Tourer Paul did a complete video walkthrough of the haunt, and we present the (mostly) unedited video here, so everyone can watch the chaos unfold! September 16, 2013 - Historical Reviews Done! 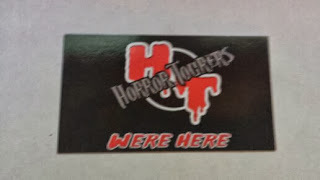 With our just posted reviews of Trilogy of Terror in Roselle, Lombard Jaycees Haunted House﻿ in Lombard, Saint Pascal's Haunted House﻿ in Chicago, Eleventh Hour Haunted House﻿ in Melrose Park and an oldie from 2010 - Monsters and Madmen in Homer Glen, all of our historical reviews are now up. Over 100 reviews, 40+ videos, and hundreds of photos of Illinois and NW Indiana haunts, all available for your perusal. Check them all out while we wait for the 2013 season! Today on our countdown we bring you one of our favorite haunts, and one we've been going to for the past five years or so. It's one of those haunts that is better than it might seem at first glance. If fact, it's really good! What is it and where is it? It's St. Pat's Haunted High in Kankakee. Located in and old, abandoned high school building, this haunt takes full advantage of the surroundings, making visitors travel up and down old staircases, through dilapidated (though not unsafe) corridors and former schoolrooms, all the while being assaulted by various ghouls. Not only does St. Pat's use the main high school building, the haunt continues outside and down into the basement as well, so there's plenty to see! Check out our full review here. After a brief hiatus (to check out our first haunt of the season - a Friday the 13th special! ), we're back with a fantastic home haunt located in Plainfield, IL. Winding Creek Haunted Woods is just that - a large haunted wood setup beside a (real) creek. In addition to the outdoor portion there is also a traditional indoor haunted house portion. Overall, Winding Creek is one ofthe best home haunts we have seen, and rivals a number of smaller pay haunts in its level of detail and length. This one is definitely on our "to do" list for 2013! 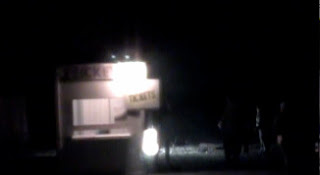 Our on the spot review of the Torture Point haunted trail in Crete, IL. We loved this haunt in 2010 - one of our favorites for that year. Unfortunately, 2012 wasn't the same. Find out our thoughts, and check out the full review here. Only 15 days until the first haunt weekend of 2013! We've got as triple play of haunts for you this time around - all of them in Joliet, Illinois. 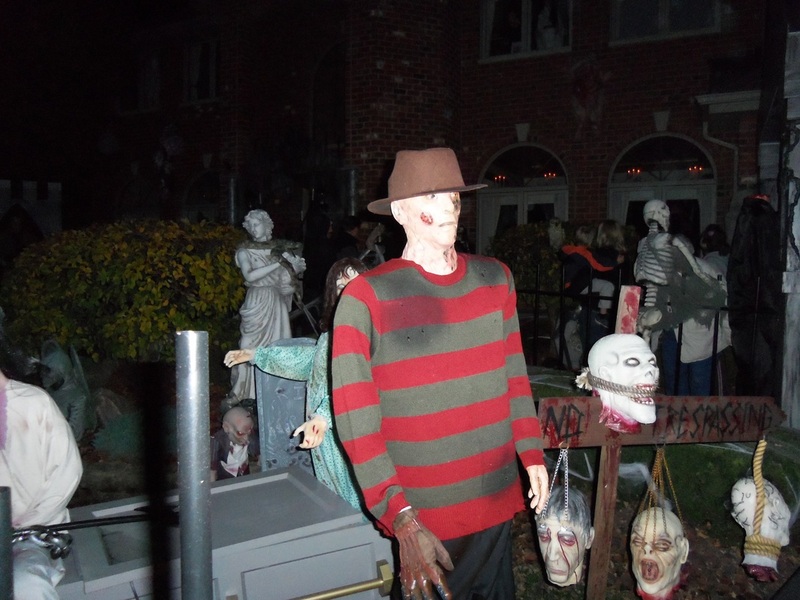 From the ghoulishly comical nature of Count Kuhadja's, to the more traditional setup of Madness on Midland, to the large, elaborate home haunt that is Agony Haunted House, Joliet boasts some excellent Halloween experiences. From ghoulish drunken hillbillies, to skeletal biker bartenders, to Victorian hearses, creepy clowns, and toxic waste dumps, you're sure to find something interesting at one of these haunts. Click on any of them to see our full reviews. Occasionally, we at Horror Tourers come across a haunt we really don't like. This doesn't happen often, as even if we don't really "love" a haunt, we usually enjoy it. However, sometimes we find one that really fails on numerous levels. It's even worse when it's a haunt we used to like and have been going to for years. Our 2012 visit to Frankfort Jaycees was just that - a decent haunt that really put on a bad show, at least on the night we went there. Check out all of our reasons why, and view our video commentary here. As we move ever closer to the first weekend of Halloween season 2013, we continue to bring you new posts about various haunts we have reviewed. Today's is a home haunt located in Orland Hills, IL, that stands out amongst the many haunts we have visited. Dark Shadows, as it is called, is both a yard display and a home haunt in the owner's garage. Everything there is homemade, and some of the props easily rival those found at professional haunts. This is definitely one home haunt that you need to see. It's FREE, fun, and a great choice for an enjoyable haunt visit. For our full review, which includes lots of photos and a couple of video walkthroughs, click here. Only 18 days to go until the first haunting weekend of 2013! Our haunt for today is the Shurley House of the Dead, a huge yard display located in Orland Park, IL. There is so much to see here that it could require two trips to get it all in. The entire front yard is filled with animated and static props, and the windows of the house are filled as well. The top windows in the house contain projections of various ghouls, and there are even live actors on certain nights. It's easily one of the best yard displays we have ever seen, and if you think a yard display simply means a few pumpkins, tombstones, and ghosts, check out Shurley House and think again! For our full review, click here. Want to know how we come up with the ratings we use when visiting haunts? Want to know the criteria we base our ratings on? Check out our video explaining our chainsaw ratings and get some insight into the minds of the Horror Tourers! 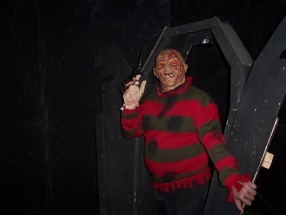 Only 21 days until the first haunting weekend for 2013, and we continue our countdown with a great pay haunt - Abyss Haunted House﻿ in Channahon, IL. This one is a very creepy haunt, part of which is set in an old barn that is supposed to be really haunted. Whether it is or not is not known, but it does add to the atmosphere! In addition to being very professional in layout, with great, detailed sets and excellent live actors, it is also one of the longer pay haunts, clocking in at about 45-50 minutes. Check out our review here. We continue to count down the days until the first weekend of Halloween Season 2013 (September 27th). Only 22 days to go! Corner of the Cursed is one of the newer yard displays that the Tourers have visited. 2011 was the very first year for this haunt, and it was decently impressive. The haunt is located on a corner lot (hence the "Corner" in the name) and has a lot of space to work with. The font yard of the house consists of various props, including a headless body bleeding into a bucket, various skeletal ghouls on the trees and in the trees, a winged Grim Reaper-like demon, and even a castle-like facade on the front of the house with ghosts hanging out of the windows. Full review here. For today's haunt, we shine the spotlight on Dead End Cemetery located, appropriately enough, on a dead end street. It features a giant spectral figure topped with a Jack-O-Lantern head presiding over the entire yard, a skeleton driving an antique hearse, a shiny golden-faced skull as the Grim Reaper, complete with scythe and severed head, and a large melting skeleton. This melting skeleton looks as though it has been severely burned, with flesh dripping off of it. It was something we had not encountered before and was certainly the most memorable part of the display. Today's entry is for Endless Road, a yard display in Justice, IL. This particular display is located down a seemingly deserted road, which makes it all the more atmospheric. There is plenty to see at this display as well. The entire display is set along a circular driveway, so visitors enter at one end, go around in a big circle, and exit back where they entered. The entrance is covered with a dark semi-transparent material that shields the display from people driving by. It adds to the Halloween feel, and it makes people get out of their cars to actually visit instead of just driving by.